Madison Chemical located in Madison, Indiana has manufactured cleaning products for the food industry, breweries and wineries among other things since 1947. The 50 plus employees work out of a multi building facility located on Clifty Drive. Two large areas of space totaling just over 20,000 sq. ft had not been re-roofed in over 20 years and the EPDM rubber was breaking down and beginning to leak into the chemical plant where raw products are stored and mixed. 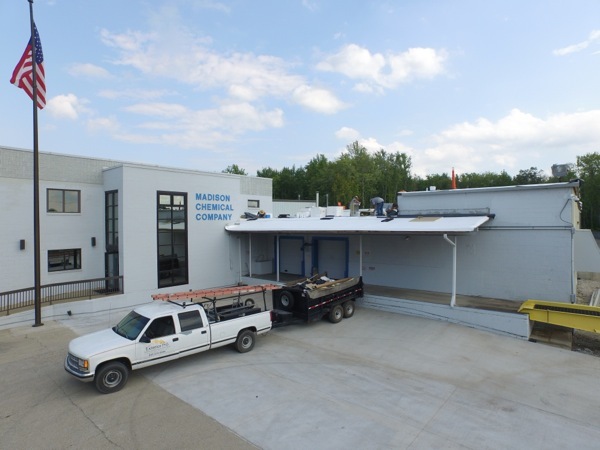 Madison Chemical owner and son, an Atlanta based architect, worked together to develop a roofing / guttering spec that would meet their needs. Exterior Pro was invited to bid the spec and after a follow-up meeting was awarded the flat roofing project. 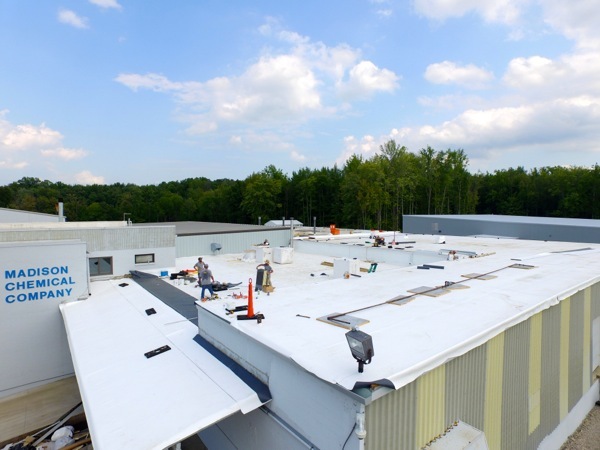 “We work at many different types of businesses and manufacturing plants repairing flat and metal roofs and we observe a variety of different types of operation structures and management styles while at theses facilities. What made Madison chemical stand out to us was quality of the its workforce and the overall work environment in the plant. Each and every employee has “bought in” to a company culture of excellence and is invested in the long term success of Madison Chemical. We felt privileged to be working such an impressive operation and group of people and we set out on our own mission to give them the best possible flat roofing job/experience we had to offer”. 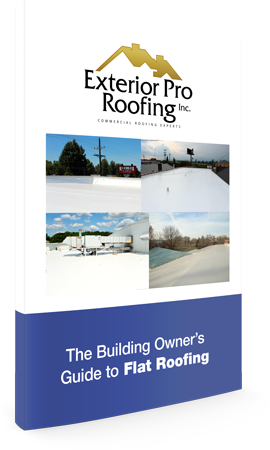 The Existing roof was, what is known in the commercial roofing industry as, a Ballasted Rubber Roof. This is the type of rubber roof that is covered in large river stone type rock. The rock serves two purposes 1) to hold rubber in place as it is not glued down but just loosed laid, and 2) it keeps the sun off the rubber extending its life. 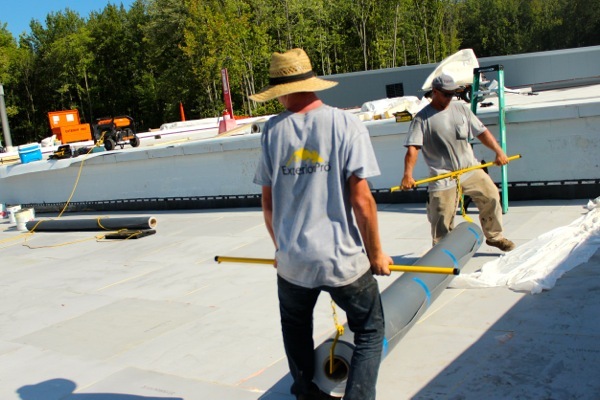 This type of roof used to b e popular because of it lower cost and ease of installation but better flat roofing membranes along with better flat roofing techniques and process have made ballast roofing obsolete. The rock had to go. Once the rock was off the roof we used a crane to hoist the material and safety equipment and got ready to replace the flat roof. 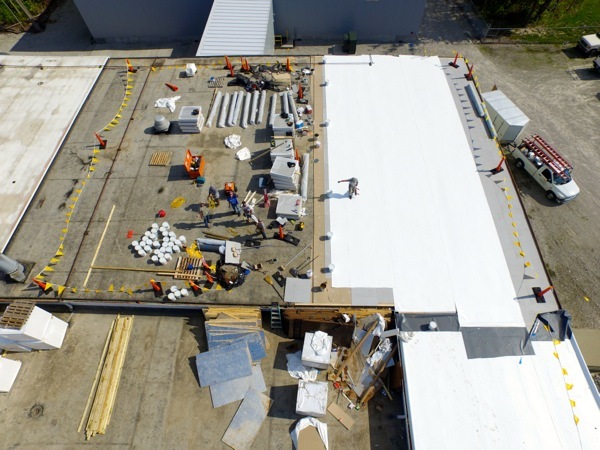 The roofing spec called for a new 60 mil TPO roofing membrane and three inches of new polyiso roofing insulation with a cover board all to be fully adhered. We used a Johns Manville white TPO deck sheet and the invinsa board over the new roofing insulation. Each day we identified a section of the flat roof the was large enough to be a good days work and challenge our crew without bitting off too much roofing that we couldn't get covered by the days end. We began each morning by cutting the existing rubber roofing and folding it back. We then were able to remove the existing insulation board and stack and bundle it to be off the building. Next, we secured a base layer of 1 1/2” roofing insulation to the concrete deck with special concrete spikes. 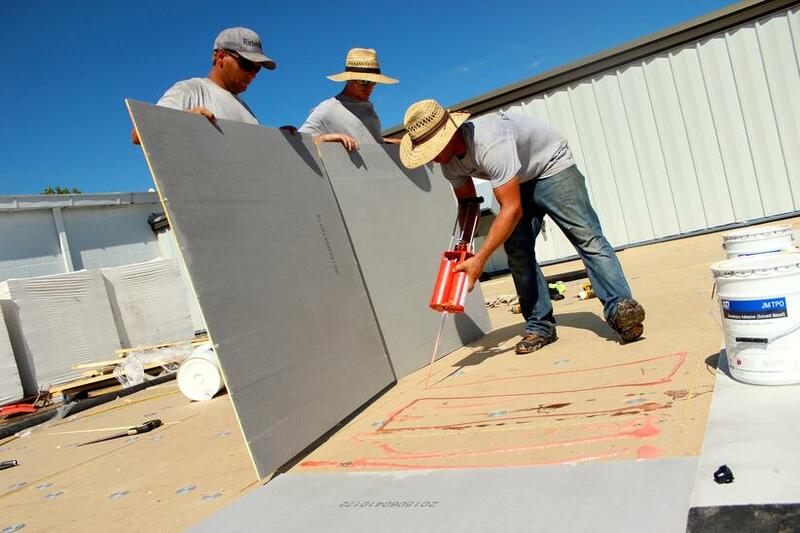 We then used a two part adhesive to glue down the next layer of insulation and the invinsa cover board. After more then 3/4 of the day spent prepping for the new flat roof installation we were ready to glue down the new TPO membrane and hot air weld the seams. Each day we repeated the process until approximately two weeks later we had completed the entire area to be roofed. All that remained to finish off the job with new commercial gutters and downspouts and install new metal counter flashings and coping caps. We hung a 7 “ steel gutter and 5”x 5” steel downspouts to handle large amounts of water coming off the large area of flat roof. We used our metal break to fabricate new coping caps and counter flashing to finish off the project. The Madison Chemical flat roof replacement job went as planned and Exterior Pro was grateful to be apart of this nice project.